Further cuts in public support for higher education in Wisconsin will harm the state’s economy, which relies on colleges and universities for talent, technology transfer and business development in the communities those institutions serve. That’s the main conclusion of “The Value of Higher Education to Wisconsin’s Economy,” a report issued by the Wisconsin Technology Council. The 28-page report was developed over nine months by the Tech Council, which is an independent, non-profit board of about 50 business, technology, investment and education leaders that has served an advisory role to state government since 2001. 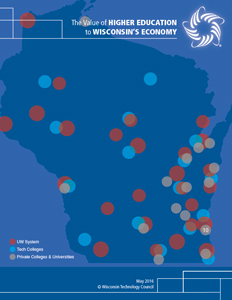 The report examines the role of Wisconsin’s public and private colleges and universities in producing workforce talent, intellectual property and economic activity, which includes one of the nation’s most robust private supply chains for supporting research and development.